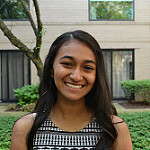 Anjali Parande is a sophomore and a first year member of TSP. In her free time, she enjoys playing tennis and dancing. Anjali loves drinking iced coffee and tea, writes mediocre poetry, sings at the top of her lungs and is perpetually laughing. One day, she would like to be a surgeon and mother of a succulent terrarium.